This was the final project for my Interactive Media & Advertising course in Spring '09. The assignment was to test our cumulative knowledge of the unique ways in which interactive destinations can tell a brand story. As a part of the assignment, we were to devise 3 creative comps - 2 of the homepage, and one sublevel page. The product I chose was the Apple MacPad Chameleon, which is a made-up product that I thought up in my Strategy & Positioning course last Fall. The MacPad Chameleon is Apple's first netbook. 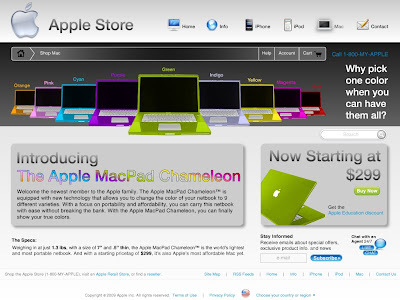 The main USP of the MacPad Chameleon is that it allows for the user to change the color of their netbook to a variety of 9 different colors. The target audience is females ages 18-25 in college who are avid users of social media, and quite fashionable. Ultimately, I wanted to design sleek and clean creative comps that didn't stray from Apple's current brand image. 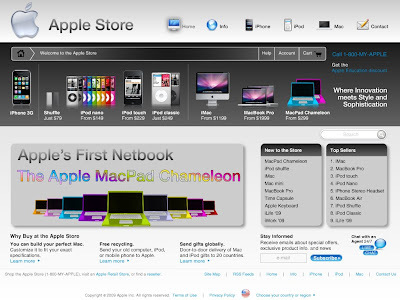 The first creative comp is the homepage of the Apple Store taking a more traditional approach. The second creative comp is brighter and overall has a different tone and feel. The third creative comp is a sublevel page from the first comp. 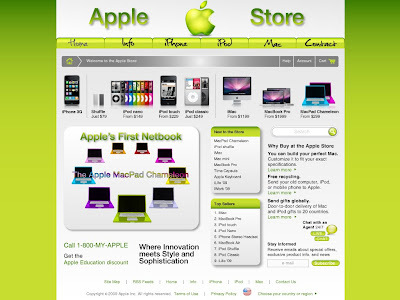 The sublevel page is the Mac page of the store. I wanted to keep everything consistent with the homepage, creating a fluid and positive user experience for the target.